Organize your garden hose with a natural hint using the Whitehall Filigree Hose Holder. 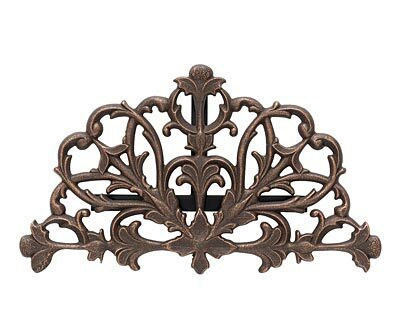 This intricately patterned holder features interlocking leaf and flower bud shapes, evoking antique metalwork. The deep bronze color, with slightly lighter accents throughout, furthers this aged and lovely look. This decorative plate extends from your wall with the help of three support tubes and a back plate. The metal backer connects to your wall near your spigot, and the three support tubes attach to that. Wrap your garden hose around these support tubes when not in use, keeping it organized and lovely. This receptacle, crafted from aluminum, is perfectly suited for outdoor use, and will remain both beautiful and usable for years to come. Bring everlasting adornment to your wall and keep your hose tidy using this Filigree Hose Holder. Made in the USA.